Businesses of all shapes and sizes make major personalization blunders on a regular basis. Although the spread and advancement of the internet has made large-scale personalization easier from a technical standpoint, it hasn’t made it that much simpler. It still takes a lot of thought, research and careful execution. Whether you’re looking to sell products or services, or just move your content into fresh markets, here’s how you can expand your personalization methods across the world. With GDPR having recently come into effect, a lot of people are concerned about the dangers of dealing with segmented data at all, let alone on a widely-international basis. They don’t consider that personalization strategies don’t inherently need to involve specific real-world customer data. It’s entirely possible to stick to generalized buyer personas and forgo the granular analytics. Even so, every new country or region with its own national and local laws could present a new challenge to your operation, requiring your designs and materials to adhere to a slightly different set of regulations. The moment you start eyeing a market, do some research to learn about its restrictions, and be sure that you can straightforwardly navigate them before you approach it. Keyword research is invaluable for getting an idea of what things are popular in different places and discovering what kinds of terms get used by searchers in those areas. Add in tools like Google Trends and you have free access to an enormous amount of information you can use to better personalize your content for specific regions. In addition, try utilities such as Answer the Public or KeywordTools.io to glean some of the most popular questions people ask about your particular industry niche. If users in a specific country are highly curious about an element of your business that isn’t as popular elsewhere, you can think about producing some detailed content on that element for that market. The farther afield you go, the more likely you are to run up against regional differences that are quite difficult to break down. Differences in media consumption, pop culture, slang terms and even relatively mundane habits vary from place to place. While you can certainly nail the basics of addressing particular demographics regarding things like income, age and occupation, it’s a lot harder to address more complex differences, and rarely a good idea to ignore them entirely. Because of this, you should make good use of local experience by consulting area experts, such as localization service providers. Essentially, you’re looking for people who know the culture in detail and can both explain its nuances to you and review the materials you provide to see if they are satisfactory. When local experience gets ignored, you see wild PR blunders, often involving phrases that are very tricky to translate accurately or terms that refer to entirely pedestrian things in some places but shockingly taboo things in others (think “fanny” in America and in the UK). Your website is the cornerstone of your online operation, and thus your entire global operation, as you can’t have a genuinely worldwide office — but you can certainly have a worldwide website. 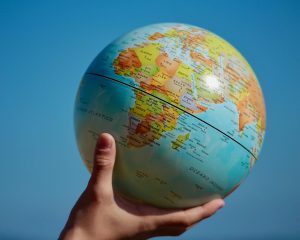 You have two options for catering to a global audience with your website: you can make it multilingual and provide a language selection option, or you can separate it into regional sites or subdomains. For the sake of parsimony, having a single multilingual site is preferable in most cases, at least for smaller businesses — it also avoids the content cannibalization and language identification problems that can result from having a similar page for each of a variety of languages and/or locations. Anyone running a store on an extendable CMS will at the very least be able to find an add-on, plugin or extension to assist with basic product translation. For instance, Shopify’s quick-setup ecommerce builder doesn’t offer native multilingual support, but Langify is a viable add-on. Magento, meanwhile, can handle multilingual store views out of the box (though the languages still must be installed as extensions). The advantage of using a plugin of some kind of do this is that you can avoid the complications of trying to implement hreflang tags manually. When stressed developers set them up incorrectly, it causes lasting damage in rankings across various regional search engine variants. The global market isn’t all that scary, despite how much it varies, because people only differ to a certain extent. We all go online, use services and buy products to solve our problems and make us happier and more content. That applies whether you’re selling in Europe, North America, China or Australia. Think of global personalization as a process of making minor tweaks, adding to what works in a certain locale and taking from what doesn’t. It isn’t something you need to overthink, and there’s no need to obsess over minor details — your localization vendor can help you do that, if that’s the route you’re going. Keep your eye on the big picture, get the basics right, avoid any major errors, and focus on your fundamental business model. If you can do that, you’ll set yourself up for a successful global expansion.